Every time Joshua “The Passion” Pacio steps into the ONE Championship cage, it is in pursuit of a lifelong dream, one that he has had since a young boy growing up in Baguio City in the Philippines. Having already conquered the Philippine and regional martial arts scenes, winning several titles along the way, only one target remains – the ONE Strawweight World Championship. The 22-year-old Team Lakay standout may be one of the younger competitors in the organization, but he has already emerged as a seasoned leader in one of the most well-respected gyms in Asia and could be the next martial arts superstar of the Philippines. Ever since falling short in his bid to capture the ONE Strawweight World Championship title against then-titleholder Yoshitaka “Nobita” Naito in October 2016, Pacio was a man on a mission to catapult himself back into title contention. However, it was not a smooth path going back to the world title stage for Pacio as he has had a mixed run of results. After a career-defining split decision win over former world champion Dejdamrong Sor Amnuaysirichoke in March, Pacio was then submitted by top Japanese prospect Hayato Suzuki in the first round of their recent August clash. Although he managed to redeem himself by scoring a highlight-reel knockout of former boxing champion and compatriot Roy Doliguez this past November, Pacio still looks for consistency with regards to his performance inside the ONE Championship cage. “It’s more about consistency. To be consistent inside the cage is what I am for at present. I have to win it all if I want to be back in the title contender’s position. A single loss could bring me back to square one. However, I am willing to work for it,” he said. Despite the rough road back to vying for the ONE Strawweight World Championship, Pacio is inspired to embrace the grind as he witnessed Team Lakay’s elder statesman Eduard Folayang endured a tumultuous period of uncertainty in his martial arts career before becoming one of the brightest superstars and most beloved titleholders in ONE Championship history. “Before he (Folayang) got the belt, he went through a lot of ups and downs in his career. He was beaten and was knocked out twice, but I saw the fight still burning in him,” he stated. “Now, he still goes to the gym and tries to get better and better every day. He taught me a lot about life and its spiritual side, and he taught me positive attitudes that will bring me up in my career,” Pacio added. According to Pacio, it has been his mantra to turn his heartbreaking losses into lessons that would give him the fresh perspective to persevere and push forward until he achieves his goal. His hunger to take things into another level showed in his most recent outing as he knocked out Doliguez in the second round with a spinning backfist last November. Pacio has the chance to make it two in a row as he is set to duke it out with China’s Lan Ming Qiang on the undercard of ONE: GLOBAL SUPERHEROES, which takes place at the 20,000-capacity SM Mall of Asia Arena in Manila, Philippines on 26 January. Pacio was originally scheduled to square off with Pongsiri “The Smiling Assassin” Mitsatit in the co-main event, but the undefeated Thai was forced to withdraw from the contest just a week out from the bout due to injury. Lan accepted the offer to step in for Mitsatit and face a former world title contender like Pacio in his promotional debut. “I was excited about my bout with Pongsiri because it would have been a clash of the young guns. I am not disappointed because it is safety first. If I was the one sick or injured, I would not compete either, so I hope he recovers fast and gets back on track,” he shared. “Lan Ming Qiang is my new opponent now, and I need to adopt quickly to his style. But our game plan is still the same, and I will execute that on 26 January,” Pacio further explained. From Guangxi, China, Lan is a national sanda champion who trains alongside flyweight world title contender “The Southern Eagle” Ma Hao Bin at the Jincan Defense Club. 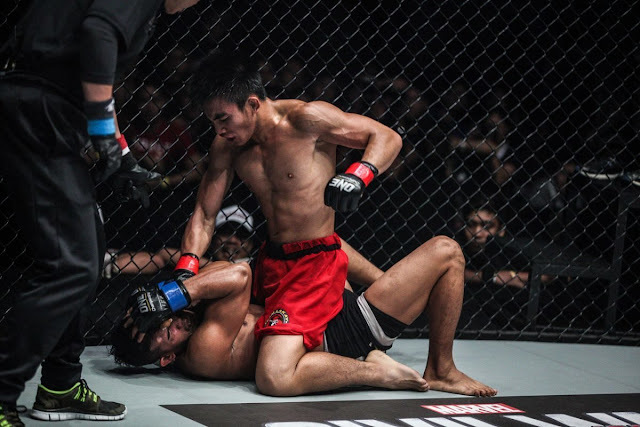 After a 16-2 Wushu Sanda record and several championship titles, the 24-year-old Chinese prodigy recently made his transition to the cage and already has a pair of stunning victories to his credit. The opponent change has not affected Pacio or his training at Team Lakay, revealing that he will continue his normal preparation alongside head coach Mark Sangiao and his world-class teammates. For Pacio, his three-round cage encounter with Lan is an opportunity to build some momentum. “I see this match as a very exciting one because I know we are both warriors, and I know we will put everything on the line on the 26th,” he ended. ​​​​​​​For more updates on ONE Championship, please visit www.onefc.com, follow us on Twitter and Instagram @ONEChampionship, and like us on Facebook at https://www.facebook.com/ONEChampionship.